ClothingJust what young dinosaur fans and budding palaeontologists need – a range of top quality dinosaur clothing featuring lots of dinosaurs and favourite prehistoric animals. Whatever the weather, Everything Dinosaur has it covered with this range of dinosaur and prehistoric animal themed clothing. Customers who purchased dinosaur clothing also checked out our inexpensive dinosaur toys just part of the amazing range of products available to buy online from Everything Dinosaur. Soft ToysDinosaur stuffed animals, Ice Age soft toys and dinosaur soft toys to purchase online. A range of soft and cuddly and very cute prehistoric animal soft toys, including all the favourite dinosaurs. A dinosaur stuffed animal, whether it is a soft toy T. rex, Triceratops or a Diplodocus, they make an ideal gift for a young dinosaur fan. Cuddly dinosaur and prehistoric animal soft toys and dinosaur bedtime buddies to help keep young children warm and snug on a cold night. All soft toys including Dinosaur soft toys are approved by the teachers and experts at Everything Dinosaur. The Beasts of the Mesozoic figures range of 1:6 scale articulated raptor figures. 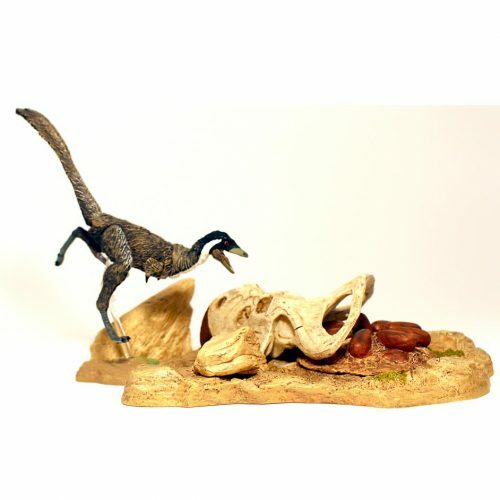 A superb range of articulated prehistoric animal models, including a 1:6 scale Velociraptor mongoliensis and the Fans’ Choice Dromaeosaurus albertensis dinosaur model. A range of beautiful Beasts of the Mesozoic dinosaur figures, aimed at discerning model and figure collectors. Hand-painted, articulated prehistoric animal figures to display that are ideal for the serious, enthusiastic dinosaur fan. State-of-the-art modelling techniques to produce fantastically detailed feathered dinosaur figures, with numerous points of articulation. Each Beasts of the Mesozoic prehistoric animal figure is based on the latest scientific research. Dinosaur model collectors also viewed: Rebor Replicas, another collection of amazing prehistoric animal figures exclusively stocked in the UK by Everything Dinosaur . Buy Beasts of the Mesozoic figures and prehistoric animal models on line. Everything Dinosaur stocks a huge range of raptor series action figures – collect them all! The Beasts of the Mesozoic range is a fantastic collection of highly collectable figures and replicas. For further information, dinosaur data, tips and advice on dinosaur model collecting or any other product within the extensive Everything Dinosaur range such as Papo Models or to find out more details about the figures in the Eofauna Scientific Research Models range, contact our office team via email. View basket “Beasts of the Mesozoic Raptor Series Adasaurus mongoliensis” has been added to your basket. Beasts of the Mesozoic dinosaur models, prehistoric animals and raptor figures. Scale replicas to buy on line from Everything Dinosaur. A range of hand-painted, realistic, beautiful, scale models of prehistoric animals and dinosaurs including many 1/6th scale scientifically accurate dinosaurs and raptor figures, with great detail and articulation. All named prehistoric animal replicas and models in the Beasts of the Mesozoic collection are supplied with their very own fact sheet written by the experts at Everything Dinosaur, so you can read all about dinosaurs and other creatures from the past. These fantastic replicas are a must for collectors. These prehistoric animals and Beasts of the Mesozoic figures are great display pieces. Customers who visited these pages looking for Rebor dinosaurs also checked out: CollectA Deluxe Prehistoric Life to view more scale models of prehistoric animals. > How Big is the PNSO Ceratosaurus? By filling in this form you agree to our Privacy and Cookies Policy and and our Trading Terms and Conditions.